280 pages | 20 B/W Illus. George Bernard Shaw once said that reasonable people adapt themselves to the world but unreasonable people adapt the world to themselves. In a sense, this book explores how these so-called ‘unreasonable people’ may interact to re-fashion the world around them in fragile economic development. Drawing on empirical research in the volatile and traditional context of Afghanistan, the study investigates the challenge of poor women’s participation in business and diverse outcomes for local development. 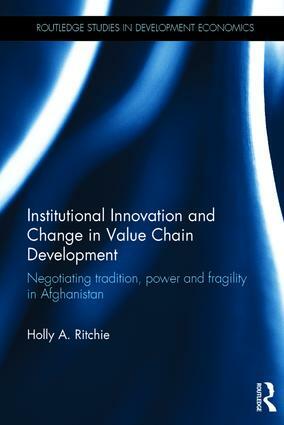 Institutional Innovation and Change in Value Chain Development takes a unique look at nuanced institutional phenomena through the lens of social institutions, with a subtle appreciation of the interaction of structure and agency. Drawing on in-depth qualitative research in Afghanistan, the case studies specifically investigate the transformation of the women’s norm of purdah, and the subsequent development of new market institutions in three women’s enterprises. Shedding new light on the opaque process of institutional change, the research shows that external actors (such as NGOs) can both initiate and guide institutional development in fragile environments. Yet there may be limitations to their endeavours, with strong resistance from local power holders. Meanwhile, dominant entrepreneurs are shown to play a major role in fostering institutional development pathways. This influences the scope of inclusion and exclusion in enterprise and value chains, and broader streams of socio-economic development. Holly A. Ritchie is currently a research fellow at the Institute of Social Studies (ISS), Erasmus University, the Netherlands, and part-time lecturer with a strong interest in gender, institutions and economic development in fragile environments.